Most of UBC Okanagan’s garbage can be recycled. Use this A-Z guide as a resource to discover what can be recycled, returned or composted on campus. The BC Recyclepedia can help you determine what to recycle and where, off campus. The Regional District of the Central Okanagan (RDCO) recycling brochure can be viewed here. Aluminum foil and tin plates, free of food residue or other contaminants (ie. oil), are accepted in the blue recycling bins located around campus. If material is not cleaned prior to disposal, please place in black/grey waste bin. The Battery Recycling Program is a partnership between Risk Management Services and Call2Recycle, created to recycle non-rechargeable batteries, rechargeable batteries and cell phones for free at UBC. There are numerous drop-off locations across campus that can be found on the main floor of most buildings near the recycling stations. Contact Risk Management Services for more information. Xerox product users: Empty Xerox toner cartridges are recyclable. When space is available, place empty toner cartridge back in box and leave on shelf for pick-up when Xerox personnel deliver new/replacement toners. If no space is available, or the toner cartridges are not Xerox brand, replace cartridge in box and place beside the blue recycling bins for pick-up by the Pathways Kelowna or submit a work request to Facilities Management requesting removal. Individual printer users: An on-campus recycling program is under development. In the meantime, ink and toner cartridges are part of BC’s Extended Producer Responsibility (EPR) Programs, this means you (the customer) have already paid an environmental fee to cover the cost of recycling this product at a retail location, therefore, the product retailer must accept the used product back for recycling purposes. Return your empty ink and toner cartridges to the place of purchase, or inquire with stores near you. Used cell phones can be recycled through the Cell Phone Recycling Program, via the battery collection boxes. This program is a partnership between Risk Management Services and Call2Recycle created to recycle non-rechargeable batteries, rechargeable batteries and cell phones for free at UBC. There are numerous drop-off locations across campus that can be found on the main floor of most buildings near the recycling stations. Contact Risk Management Services for more information. The Chemical Exchange Program is a free service provided to the campus community by Risk Management Services. The program identifies and tracks chemicals no longer of use to the original users, and diverts them from disposal to other potential users on campus. It not only reduces purchasing costs of chemicals, but also reduces disposal costs. Contact Risk Management Services if you are interested in any of the chemicals listed on the program’s website. Recycling coffee cups, lids and sleeves has been notoriously confusing in the past. Good News, ALL single-use coffee/hot beverage cups, lids and sleeves can now be recycled. Place empty, and where available, rinsed cups, lids and sleeves into the blue recycle bins found around campus. Do not put liquids into the bin. Reduce the use of single-use disposable cups on campus and avoid the recycling stream all together. Did you know that you can save $0.50 – $2 a week, or $50-100 per year, just by using your own mug to campus for coffee? Through the Aramark Lug-A-Mug Program customers receive a $0.50 environmental discount at campus Green Thread, HotSpot, Booster Juice/Extreme Pita and Sunshine Café eateries. Tim Hortons and Starbucks offer a $0.10 environmental discount to customers who bring their own mugs. Vegetable and fruit waste, coffee grinds, loose leaf tea and egg shells can be composted through the yellow compost bins located at campus-wide recycling stations. These items are collected and converted into soil amendment to be used again by Facilities Management for landscaping right here on campus. Please keep all types of paper, such as compostable paper food packaging and all plastics out of the yellow compost bins – even plastic labelled “biodegradable” or “compostable” as these plastics are not currently compatible with the campus’ composting facilities. 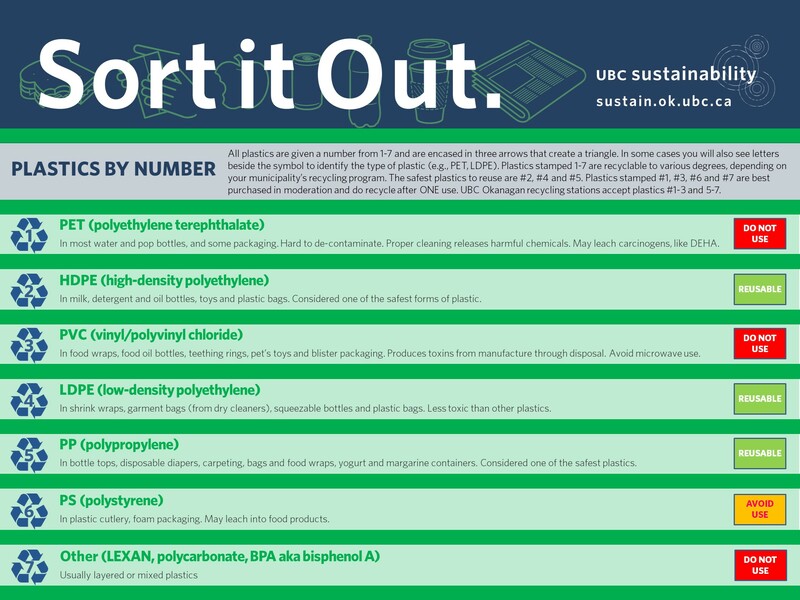 For any questions or further information on what is compostable on campus visit the Sorting Guide. UBC’s Supply Management department has identified Iron Mountain as the preferred supplier for confidential document destruction through the UBC BuySmart program. Click here for more information. UBC seeks to reduce waste from all demolition, construction and renovation projects by optimizing material use, reducing waste generated, and increasing waste diversion. A copy of the UBC Okanagan’s Construction & Renovation Waste and Diversion Tracking Sheet can be downloaded here. To view full Sustainability requirements and reporting templates, as outlined within the Technical Guidelines, visit here. Clean and empty plastic food and drink containers stamped #1-7, including yogurt containers, plastic milk jugs and empty cold drink cups, e.g. iced cappuccino or frappuccino cups, can be deposited into the blue recycle bins located inside and outside every building on campus. To prevent contamination do not put food or liquids into the blue bins. For any questions or further information on which containers can be placed in the blue recycle bins visit the Sorting Guide. Across campus glass bottles, jars, pop cans, beverage bottles, juice boxes and milk cartons can be deposited into the green returnable/refundable bins located in all academic buildings. Please empty and rinse containers to prevent contamination prior to depositing items into the green bins. Green bins are emptied and their contents returned to depots for deposit collection by Pathways Kelowna. Funds collected by this group are used to support their non-profit initiatives. For any questions or further information on which containers can be placed in the green refundable/returnable bins visit the Sorting Guide. Place all collapsed corrugated cardboard beside blue recycle bins located in the hallways in all academic buildings on campus. This material will be collected by Pathways Kelowna on their regularly scheduled collection days. Submit a work request to Facilities Management if large quantity collection is required. DID YOU KNOW: You can recycle your clean pizza box! Simply place clean parts of the box in the blue recycle bin and soiled greasy parts in the garbage. Facilities Management operates the Deskside Recycling program that consists of a large blue bin for paper recycling and a miniature black garbage bin as an attachment, which are placed at individual workstation units across campus. Work station occupants are responsible for emptying their deskside bins into larger garbage bin and blue tote or multi-stream recycling bins located in main hallways. Submit a work request to Facilities Management to request Deskside Recycling bins for your office or department. Help reduce the amount of waste that take-out containers produce – bring your own. Aramark offers a $0.50 environmental discount to faculty, staff and students who bring their own reusable containers to their Sunshine Café and Green Thread food locations. A $0.10 discount is offered at The Well. To reduce single use food container waste on campus, first-year students living in residence who have a mandatory meal plan received a reusable takeout container from UBC Okanagan’s Student Housing and Hospitality Services in September 2015 and will again in 2016. This program will also help students save money, a $0.50 environmental discount is applied when they use the containers at the Sunshine Café or Green Thread locations and a $0.10 discount is offered at The Well. Electronic waste (e-waste) and universal waste are materials that may contain hazardous components capable of contaminating our air, water or soil if disposed of improperly. Please do not throw these materials into the waste stream. E-waste such as old computers, televisions, computer parts, towers and monitors, fax machines, printers, scanners, copiers, stereo equipment and appliances can be recycled. Cell phones are also accepted in this program as well as in the battery collection boxes. Please submit an online work request to IT Services for proper routing of recycling. Items collected on campus are recycled through Planet Earth Recycling Ltd.
Glass containers such as pop bottles and empty food jars can be recycled in the green refundable/returnable bins located at campus-wide recycling stations. Additional glass recycling and collection can be completed by submitting a work request to Facilities Management. Lab glass that has been chemical-contaminated or biologicals-contaminated are not to enter the waste stream and are required to follow disposal guidelines established through Risk Management Services, the guidelines are available here. Uncontaminated lab glass is collected in 20L buckets with green labels by Risk Management Services. Clean lab glass waste is re-purposed rather than recycled. Plate glass, i.e. slides and windows, is not permitted in this waste stream. Please contact Risk Management Services for more information. Refer to the Risk Management Services Hazardous Materials Management webpage for information on the management of: Chemical Waste, Biohazardous Waste, Radioactive Waste, and Glass Waste Disposal. The Sustainability Office, Risk Management Services, Finance Operations, and Facilities Management are working together to eliminate recyclable plastics from the campus waste stream. As a key action toward the achievement of this goal, the Lab Plastics Recycling Program was developed in 2010 to capture and recycle all plastic packaging and non-hazardous plastic lab products supplied to our campus laboratories. Visit the program’s website for more information. A new recycling program for lab plastics, the Pipet Tip Box Recycling Program: From the Lab Bench To the Park Bench, is available March 2016. Click here for more information. Does your office space or hallway have a burned out light bulb? Submit a work request to Facilities Management and they will change the light bulbs and recycle them through LightRecycle. Contact Risk Management Services for the collection and environmental disposal and recycling of waste oil. Where possible, please place waste oil back into original containers. This increases recycling options for this material. Waste oil disposal procedures can be found on pg. 57 of the Laboratory Pollution Prevention and Waste Minimization Manual. Contact Risk Management Services for the collection, environmental disposal and recycling of waste paint and aerosol cans. ALL paper products can be recycled at campus-wide recycling stations using the blue recycling bins. Facilities Management, through Pathways Kelowna, deposits commingled recyclables, including paper products, into the large institutional recycling bins for sorting at the contracted multi-stream recycling centre. For more information on what items are recyclable on campus visit the Sorting Guide. This program is not available on campus. The provincially regulated Medications Return Program allows consumers to return unused or expired medications to over 90% of participating pharmacies in the province at no charge. This program accepts all prescription and non-prescription medicines, including herbal products, mineral and vitamin supplements and throat lozenges. To find participating pharmacies near you: Health Products Stewardship Association. For more information about provincial stewardship regulations: BC Product Stewardship – Pharmaceuticals. Pharmaceutical wastes used in teaching and research should be disposed of through the Risk Management Services Hazardous Materials program. Contact Risk Management Services for more information. Photographic waste containing greater than 5 ppm of silver is considered hazardous waste and prohibited from entering the sewer system. Silver, if introduced to the water system, is toxic to fish. For further information please contact Risk Management Services. Lab plastics recycling simplified. The Sustainability Office is offering campus labs another sustainable mechanism to minimize their environmental impact. ThePipet Tip Box Recycling Program: From the Lab Bench To the Park Bench collects clean, empty pipet tip boxes and turns them into plastic pellets used to make park benches. Click here for more information and to request a collection box for your lab. On campus: Plastic bags (plastic #4, also known as soft plastics) are not currently accepted material in UBC Okanagan’s recycling stations. However, there is a Lab Plastics Recycling Program aimed at recycling soft plastic materials accumulated by UBC Okanagan labs. To reduce plastic bag use on campus, please bring your own reusable bag whenever possible. Off campus: The local Return-It Depots do accept #4 plastic bags and many types of soft plastics. Visit Return-It Depot for more information and to find a location near you. Several retail outlets, including London Drugs, Safeway, Save-On-Foods and Wal-Mart, offer a collection system for recycling plastic shopping bags. To find participating retailers near you visit: www.myplasticbags.ca. Download printable version of Plastics by Numbers chart here. Plastic containers stamped #1-3 & 5-7 (also known as hard plastics) can be recycled in the blue recycle bins at recycling stations across campus and in offices. For more information visit the Sorting Guide. The Lab Plastics Recycling Program and Pipet Tip Box Recycling Program offer additional recycling solutions for UBC Okanagan labs. Scrap metal that has been chemically contaminated should be collected for recycling through Risk Management Services. Contact Risk Management Services for more information. Scrap metal that UBC Okanagan collects for recycling include: Steel, Stainless Steel, Aluminum, Tin, Brass, Copper, Electrical Wire, and even appliances and large equipment! If you have scrap metal or uncommon items that can be recycled, submit a work request to Facilities Management to arrange a pick-up time. All scrap metal and other uncommon recyclables are collected by Facilities Management to be diverted from landfills and stored at the Quonset facility on campus. Collected scrap metal is acquired by local recycling facilities where it is sorted and sent out for further processing. Scrap metal can be recycled repeatedly, in fact, the Canadian Steel Producers Association claims that “steel is the most widely used metal and most recycled material on Earth”. Recycling scrap metal and other items on campus is easy, economical, beneficial for the environment, and helps to reduce UBC Okanagan’s environmental footprint. Currently, solvents are not recovered at the campus level, but this may change in future. If you would like to recycle or recover solvents in your own lab, please contact Risk Management Services for further information. Event organizers need to plan for recycling and composting bins appropriate to the event type and the type of waste the event will generate. Refer to the Sorting Guide for sorting information and to download a printable guide to post above sorting station during event. Submit a work request to Facilities Management to request sorting station bins. On campus: Institutional Styrofoam recycling is available. Place packing/block styrofoam into clear plastic bags and place beside blue recycling bins located in all academic buildings’ hallways for collection. Note: packing peanuts, chips and noodles are not accepted. The collected styrofoam is sent to PolyRock where it is recycled into synthetic aggregate for use in construction and other applications. Off campus: Residential Styrofoam recycling is available at all Return-It Depots and municipal landfills in the Okanagan. Additional recycling locations include London Drugs. Styrofoam items accepted include: cushion packaging to protect electronics, washed meat and poultry trays, food free take out containers and egg cartons. View RDCO recycling brochure here. UBC Okanagan’s Bookstore provides a textbook collection/donation box just outside their Admin. building location. The textbooks collected are send to Better World Books for resale or donation. The Bookstore also runs a textbook buyback program (scroll down page for information). At the Vancouver campus’ location, they work with Books for Africa, a non-profit organization that ships textbooks to Africa. You can donate unwanted books to this program and the bookstore will ensure that they continue to be of use to students in developing nations. The GreenText and More Bookstore offers book consignment service to students. Visit the GreentText website for more information. Overhead transparencies (plastic #1) can be recycled in the blue recycle bins at recycling stations across campus. Refill your reusable water bottle with fresh, free, filtered water! Every academic and administration building and a number of residences on campus house a WaterFillz kiosk station providing UBC Okanagan’s constituents with cool, 38 degree water while saving the University energy and reducing waste generation. Many products that are received come delivered on wooden or plastic pallets. Departments that receive goods and have the pallet as a by-product can make arrangements through Facilities Management to remove and store the pallets until the quantity collected is sufficient enough to call a local company for pick-up. Collected pallets can be re-used for future shipping or re-purposed into another item, such as lawn furniture. Submit a work request to Facilities Management to arrange collection. Contact the Sustainability Office for more information.